As a native son, I’ve always felt that Philadelphia has been unfairly criticized from other quarters. Exhibit A: Whenever one of our sports teams is involved in a big game, sports columnists from the opposing city never fail to mention that Eagles fans once threw snowballs at Santa Claus. What they invariably leave out is that it happened in 1968. Apparently, there is no statute of limitation that applies to metropolitan rivalries. Maybe the collective sensitivity stems from an inferiority complex. (I’m looking at you, New York City.) But the City of Brotherly Love has plenty to be proud of. The fifth-most-populous city in the United States, Philadelphia once served as the nation’s capital and is the home of Independence Hall—birthplace of the Declaration of Independence and the Constitution, as well as the Liberty Bell, America’s iconic symbol of freedom. As it turns out, it’s also at the center of a large collection of restaurants that accommodate gluten-free diners. The city’s history and vibrant arts and culture scene have long enticed visitors from around the world, and its once-derided food reputation has begun to rival those of New Orleans, Chicago and San Francisco. As part of that revival, many restaurants in the region have embraced the growth of gluten-free dining. Traditional options, including pizza, pasta and burgers are plentiful. Yes, even the famed cheesesteak and soft pretzel are available in gluten-free versions. There’s much to see, do and eat in Philly, but here are places that should be dog-eared in any guidebook, no matter the season. With apologies to Boston, Old City Philadelphia is America’s most historic neighborhood. Bordered on the east by the Delaware River, the area encompasses many of the city’s celebrated tourist attractions, most of which are free. If you work up a hunger as you trace the nation’s beginnings, you’ll find gluten-free options near popular sites. The starting point, literally speaking, is Independence Hall, where representatives of the 13 American colonies, led by Thomas Jefferson, declared independence from Great Britain on July 4, 1776. At the same site 11 years later, representatives from 12 states met to debate and draft what became the U.S. Constitution. National Park rangers lead the guided tour of Independence Hall, taking visitors through the Assembly Room, arranged as it was during the country’s nascent years. It’s a scene that’s as imposing today as it was when I first visited in elementary school. The Constitution itself is honored at the National Constitution Center, which opened a decade ago as part of a transformation of Independence Mall into a panoramic landscape. You’d think that a 4,500-word, 228-year-old document would be tough to illuminate, but the museum’s planners have succeeded. The main exhibit includes a grand multimedia production combining film, a live actor and video projection on a 360-degree screen. The Center’s newest exhibit, Constituting Liberty, features one of the 12 surviving copies of the Bill of Rights alongside a stone engraving of the Declaration of Independence and a rare copy of the first public printing of the Constitution. A stop at the Liberty Bell is another item to check off your bucket list. 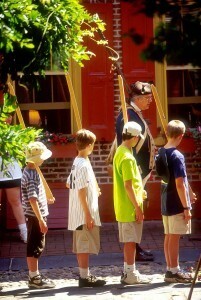 As history tells the tale, the bell was sent to Independence Hall (then the Pennsylvania State House) in 1753. Spoiler alert: The clapper cracked the bell on its first use. Two local artisans recast it twice, but after it cracked a second time it was never rung again. In 2003 the bell was moved from a small pavilion to the modern Liberty Bell Center. In the shadow of Independence Hall’s steeple, the center allows for a much brighter and photo-friendly look at this American icon than its former home. Founding father and legendary Philadelphian Benjamin Franklin is famously misquoted as having said, “A penny saved is a penny earned.” (It’s actually “A penny saved is two pence dear.”) My two cents? Skip the local carriage rides and the lines at the Betsy Ross House and head over to the U.S. Mint. Like today, money didn’t grow on trees in the late 1700s, but it did come from Philadelphia. The Mint was established in the city in 1792, and the Philadelphia location, now in its fourth incarnation, is the largest coin factory in the world. The Mint now churns out 1 million coins in 30 minutes. On the free, self-guided tours, visitors can view the actual coining operations from 40 feet above the factory floor, watching as large coils of copper and nickel are fed through presses that punch out smooth, faceless disks. Later the blanks are poured into the coining presses and become shiny pennies, nickels, dimes and quarters. 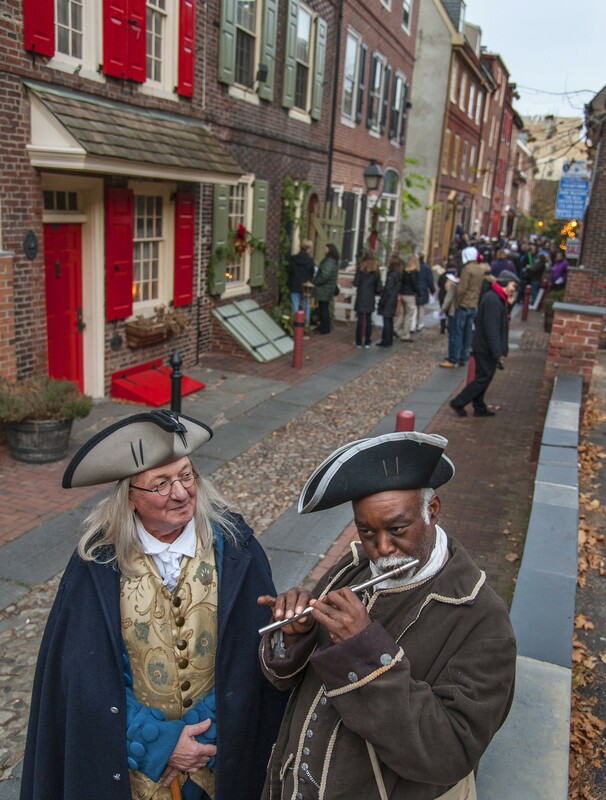 America’s oldest continuously inhabited residential street is on full display at Elfreth’s Alley, where two adjacent houses, constructed in 1755, were converted into a museum that’s open year-round. Residents welcome the public into their homes twice annually—during Fete Day in June and December’s “Deck the Alley.” Visitors can purchase a guidebook with details about each of the 32 buildings on the block. Many accommodating eateries are a cobblestone’s throw away from these sites in the eminently walkable downtown area. At City Tavern Restaurant, Chef Walter Staib offers his interpretation of 18th century colonial fare, reflecting the site’s history as military headquarters for George Washington when he was commander of the Continental Army in 1780. Staib’s hearty West Indies pepperpot soup, salmagundi (an English chef’s salad) and roasted duckling are diner favorites. Guests can even purchase the house china and pewterware as souvenirs. The city doesn’t have too many sports championships to brag about, but Philly-based chef Jose Garces can boast of his Food Network Iron Chef title. Garces’s growing culinary empire includes Amada, a Spanish tapas restaurant with an expansive gluten-free menu. The lunch and dinner options change seasonally, but the kitchen usually offers an excellent paella and a large selection of protein dishes. At the historic Penn’s View Hotel, the Northern Italian Panorama restaurant holds the Guinness World Record for the largest wine preservation and dispensing system; more than 100 wines are available by the glass. I suggest sampling the gluten-free penne as a half-order to allow for a taste of entrees, such as the seared veal medallions or pan-seared jumbo scallops. All salads and main dishes are gluten free, as are most appetizers and sauces. The two-dozen-plus wine flights lean heavily on Western European and American vintners but also include some from South Africa and New Zealand. If you’re in Old City during a weekend, Farmicia and Race Street Café are fine brunch choices, with both serving gluten-free omelets and salads. Philadelphia isn’t just the home to revolutionary history. The city has time capsules chronicling art, science and even less traditional themes, including the American penal system, rare race cars and firefighters. The city’s Fairmount section near the Benjamin Franklin Parkway, designed to as a tribute to the Avenue des Champs-Élysées in Paris, is home to many museums. Gluten-free options are limited or nonexistent in a surprising number of museums; at most you’ll find salad, fruit, yogurt and the occasional soup, but nearby restaurants take up the slack. So feed your mind in the museum and head out to fill your belly. Philadelphia Museum of Art is famous not only for the riches inside but also for a classic movie moment outside. The museum was immortalized in pop culture by actor Sylvester Stallone in the Academy Award-winning 1976 film Rocky. His underdog boxer character triumphantly reached the top of the museum steps at the end of a thrilling training montage. Visitors can take selfies with a bronze statue of Rocky at the bottom of the stairs. Even those unfamiliar with fine art, like me, will find something of interest inside among more than 300,000 pieces featuring the Renaissance, American, Impressionist and Modern eras. Featured exhibitions in 2015 include a showcase of 200 years of African-American art and the Kano-influenced Japanese painting legacy. 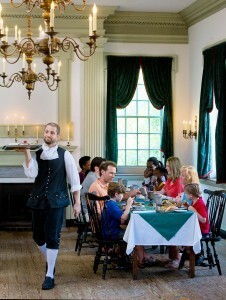 On Wednesday nights and the first Sunday of every month, the museum allows guests to pay what they wish. Another photo-op awaits in the lush garden of the Rodin Museum, where tourists pose alongside The Thinker, Auguste Rodin’s famous bronze sculpture. The museum’s collection of the French master’s work, which includes a tribute to Dante’s epic Divine Comedy poem called The Gates of Hell, is the largest outside Paris. 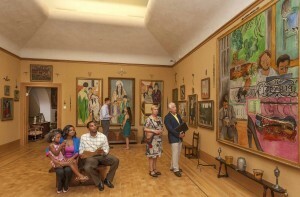 One of the city’s newest art museums houses one of the area’s oldest collections. The gleaming Barnes Foundation building features an array of Impressionist and Post-Impressionist paintings, including Renoirs, Cézannes and Matisses. Fans of the offbeat will appreciate the Mütter Museum with its anthology of anatomical specimens, models and medical instruments housed in a 19th century “cabinet museum” setting. I’m confident that there’s nowhere else in the world where you’ll find pieces of Albert Einstein’s brain, the livers of famed conjoined twins Eng and Chang, the skeletal formation of a 7-foot, 6-inch man, and a collection of 139 human skulls in one place. While mobster Al Capone’s burial site remains a mystery, it’s a fact that he was one of the most famous inmates at Philadelphia’s Eastern State Penitentiary. The cell where he served his first sentence in 1929 to 1930 is re-created at this historic prison, once the most expensive in the world. Today the crumbling cellblocks and vaulted halls stand as testaments to a noble, if ultimately misguided, attempt to “cure” felons. Along with tours, the prison offers a scavenger-hunt activity guide, free with admission for children ages 7 to 12, and, during the Halloween season, hosts Terror Behind the Walls, a wildly popular haunted-house attraction. If kids aren’t interested in roaming an abandoned prison, no doubt they’ll have a different take on two other museums: the Franklin Institute and the Academy of Natural Sciences. For Philadelphia-area school children it’s a rite of passage to walk through the Franklin’s giant replica of the human heart. The two-story exhibit, which debuted in 1954, was renovated 10 years ago to accommodate its long-standing popularity. 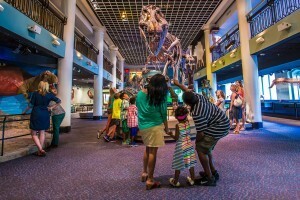 In addition to permanent exhibits that feature the wonders of electricity and air travel, live science demonstrations and planetarium shows are part of the fun for kids and parents. A LEGO exhibition of more than 70 one-of-a-kind brick sculptures—including reproductions of the ancient Greek statue Venus de Milo and a 20-foot-long T. Rex dinosaur—will be at the Franklin through September 2015. The quick-serve Franklin Foodworks cafeteria has packaged gluten-free salads, fruits and vegetables. 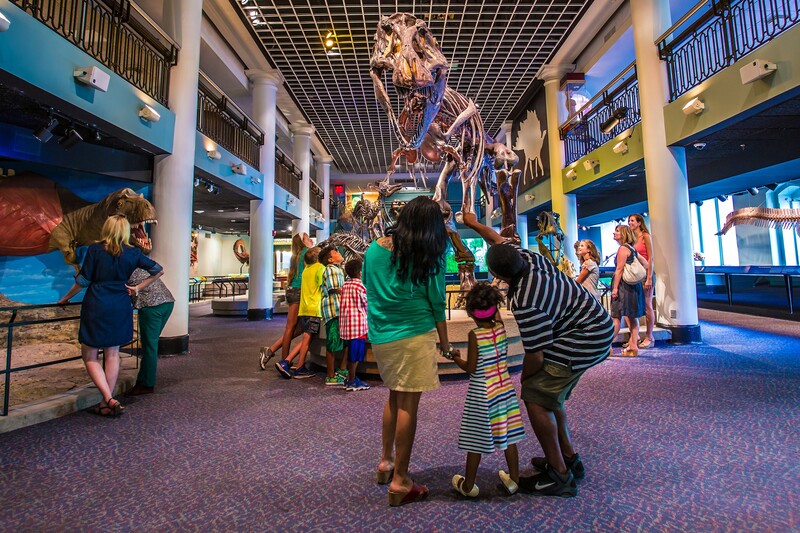 At the academy, the country’s oldest natural history museum, a fully constructed T. Rex in the Discovering Dinosaurs exhibit is a highlight. Butterflies! features a lush, tropical garden filled with colorful plants and dozens of live butterflies from Central and South America, East Africa and Southeast Asia that vary from week to week. For a quick bite, the Academy café offers yogurts, soups, salads and fresh fruit plates. For a full meal, try Rembrandt’s, which draws its name from the nearby art museums. It’s among the gluten-free-accommodating restaurants in the area. The menu offers a wealth of gluten-free appetizers, from pepperoni-pizza tater tots to achiote pork tacos and shrimp tempura. They’re enough to tempt the hungriest of eaters to skip the main course. Executive Chef Nicholas Cassidy has taken the GREAT Kitchens training course offered by the National Foundation for Celiac Awareness and uses a dedicated fryer in his food preparation. The restaurant serves several hard ciders at the bar. Tacos are featured prominently at modern Mexican restaurant La Calaca Feliz, where most menu items don’t contain gluten. Start with an order of crispy chips and guacamole before settling on one of eight taco varieties made with corn tortillas. Lemon vinaigrette drizzled on slivers of plantain-crusted blue tilapia makes the fish tacos particularly tangy. Many restaurants in the arts district offer pre-theater seating. Diners at Giorgio on Pine, with its traditional Italian dining room, can order from owner Giorgio Guiliani’s vast gluten-free menu. Guiliani, the first restaurateur in Center City to offer gluten-free pizza, serves standouts such as sweet sausage pie and Dr. Schär fusilli with mushrooms and pancetta tossed in a light cream sauce. I like to patronize local restaurants over national chains, but I make an exception for Fogo de Chão. With more than 10 kinds of beef, pork and chicken; a 30-item salad bar; and side dishes of addictive pão de queijo (warm cheese bread); crispy hot polenta; garlic mashed potatoes; and caramelized bananas, the Brazilian steakhouse is a gluten-free paradise. Diners begin their meals with the salad bar, which is loaded with vegetables, cheeses and sliced meats. Make sure the dining card you receive to signal your server (with green for “go” and red for “stop” designations) is red-side up. Otherwise, you won’t get to finish your starters before the meats come rapidly. My favorites were the tender filet mignon and the juicy picanha, but there are many other choices. Try dining here at lunch when you’ll get the same menu for half the cost of dinner. Before he ended his training run at the Art Museum in the original Rocky, Stallone’s hard-scrabble boxer rushed through the Italian Market. While many of the vendors at America’s oldest outdoor market are still Italian-owned butchers, cheese shops and seafood stores, the shops and eateries have expanded to represent Korean, Mexican and other cuisines. For gluten-free visitors, there are two must-stops at the market. Taffets turns out the most glorious gluten-free breads I’ve ever tasted. I’m partial to the chewy baguettes, sweet challahs, nutty teff loaves and soft chocolate chip cookies. 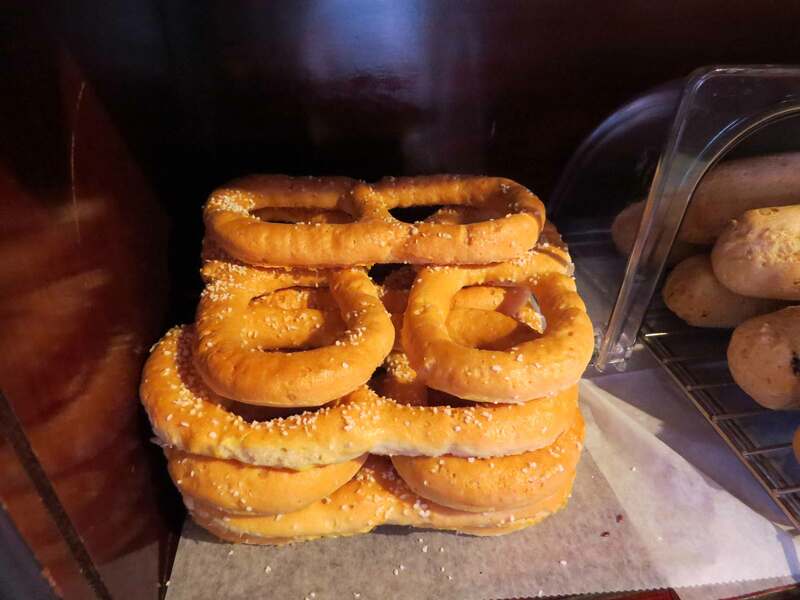 At this completely gluten-free bakery, owner Omer Taffet also kneads and rolls out a variety of bagels and twisted soft pretzels. You’ll even find ricotta-filled cannoli on occasion. Across the street, Paesano’s Philly Style offers a fresh take on the famous cheesesteak using Taffets’ freshly baked rolls. 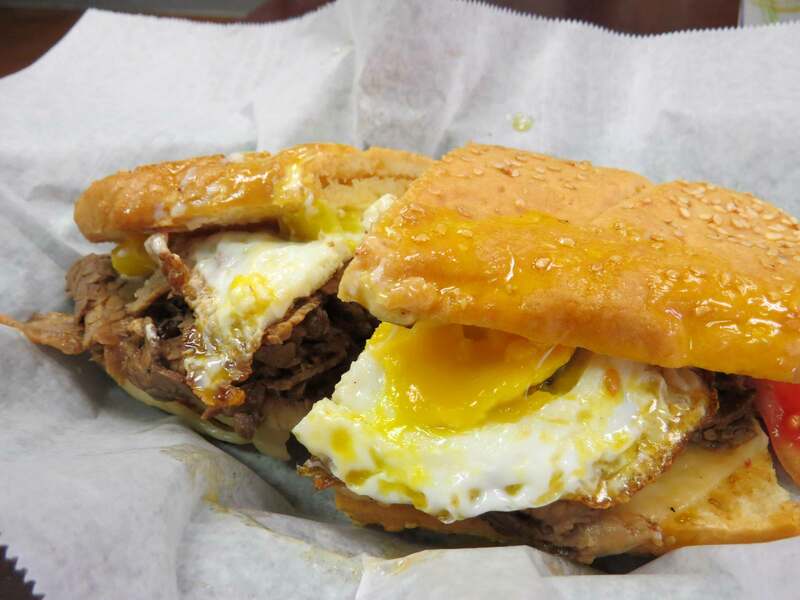 My sandwich of choice is the namesake “Paesano”—a fusion of beef brisket, horseradish mayo, roasted tomatoes, pepperoncino, sharp provolone cheese and a fried egg—chased with a Black Cherry Wishniak fountain soda. 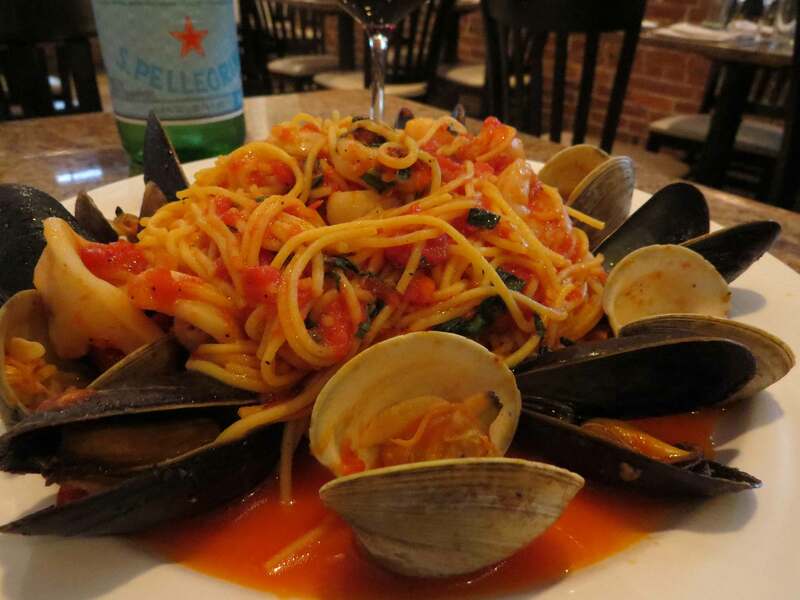 Motivated by his children’s celiac disease diagnoses, Paesano’s owner, Peter McAndrews, also has gluten-free alternatives nearby at his vibrant Sicilian-influenced Monsù. So you’ve heard the story about Santa getting pelted with snowballs? 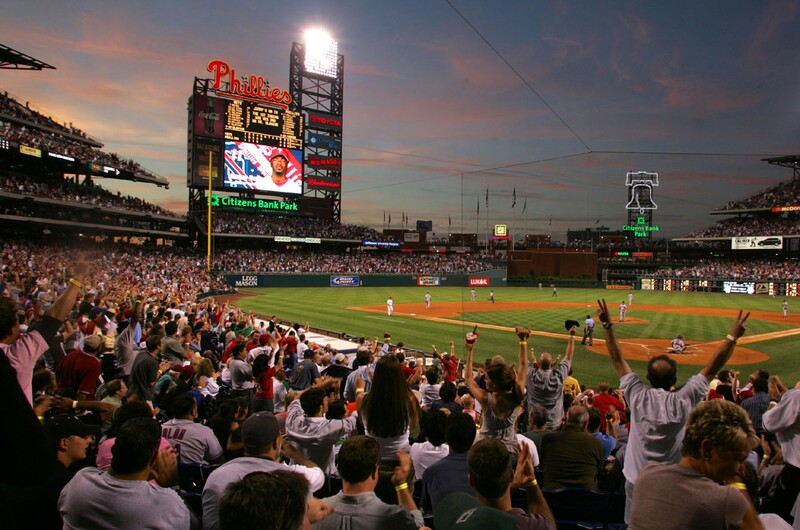 Don’t let the reputation of Philly sports fans stop you from attending a game in South Philly’s Stadium District, home to the city’s four major professional teams. It’s a friendly, if competitive, atmosphere. 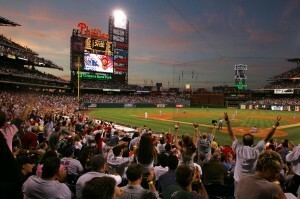 At baseball’s Citizens Bank Park, a gluten-free cart serves up hot dogs, soft pretzels, pizza slices and beer. Two dedicated kiosks were added to the Eagles’ Lincoln Financial Field last season; cheesesteaks, veggie burgers and falafel wraps are among the game-day concessions. The Wells Fargo Center, home to Flyers hockey and 76ers basketball, has a stand that sells chicken sandwiches and brownies.